Spanish master of wine Fernando Mora is setting up an association to save the old vines of his native country, before it’s too late. Speaking to the drinks business in Montreal at the Somm360 congress last week, Mora said that he has registered the domaine name ‘Save the old vines’, and was setting up a private association to protect historic vineyards in Spain – called Vino de Vina Vieja, or VVV (see Fernando sporting the logo on a newly-printed t-shirt). He also said that his move to preserve old vines would involve two stages, with the first being a classification system to identify and date ancient plantations in Spain, and the second being to promote them. 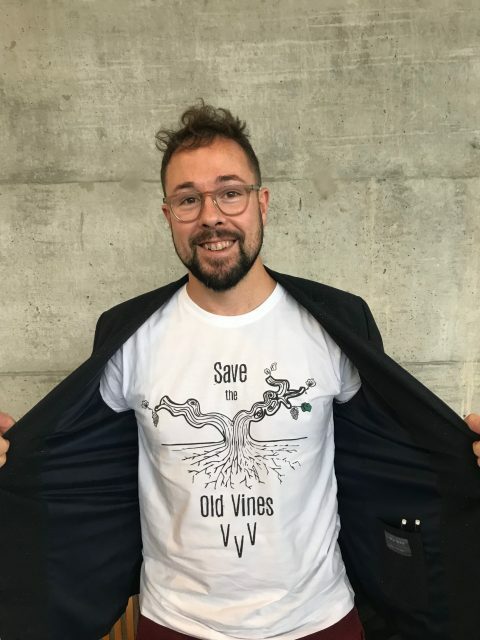 “We are preparing the rules now, but we need to define the minimum age for an ‘old vine’, which for me is 35 years old, although we also need to make a difference for vines that are older than 50 or 60 years, and also those few vineyards that are older than 100,” he said. However, he said that it was “very tough to know the real age of the vines”, and he said that he was working to verify the exact age of old vineyards using official DO (Denominación de Origen) documentation of ownership, which tends to include the planting year. Further helping Mora discover the presence of old vines are aerial photographs taken of Spain by the US Air Force during the 50s. Once the old vineyards are registered, he said that it would be possible to give the owners of these plots a VVV logo. Motivating Mora to launch this privately-funded, cross-regional classification is a fear that some of Spain’s best and oldest vineyards are being removed. “We need to avoid more vineyards being grubbed up, because in Europe you need rights to plant new vineyards, and so the old vineyards, many of which are not profitable, get removed,” he said. The quality implications of this development are significant according to Mora, not just because the county is losing its old vines, with their established root systems, but also due to the location of these long-standing plots, which tend to be found at higher-elevations. “Many of our historical vineyards are in the mountains, but they are being removed so people can plant in the valleys, and this decreases the quality of what’s being produced,” he said. Inspiriting Mora to develop VVV has been old vine classifications in Australia and South Africa, as well as VIGNO in Chile, as association for promoting old vine Carignan in Maule. “VIGNO has rescued a very depressed area, and now the producers are like rock stars – we want to do something similar,” he stated. In fact, he stressed that it was especially important to add value to the ancient vines outside the famous and regulated parts of Spain to try and ensure their survival. Those wineries interested in registering their vineyards with VVV should contact Fernando directly, who is the CEO and winemaker at Bodegas Frontonio in Aragón. As previously written about on the pages of the drinks business, there is a real or imagined cachet for old vines, but in Europe, the various monikers – vieilles vignes, viñas viejas, alte reben etc. – are used solely at the quality discretion or implied marketing intention of the producer. However, the New World is taking a different approach, and Australia has the Barossa Old Vine Charter, the US has the California Historic Vineyards Society, South Africa has audited its vineyards over 35 years old, while Chile, as mentioned above, has VIGNO.